I think the realism as a style in the painting has the broadest perspective and at the same time it is the most difficult way of expression for the artist. I always try to express myself by solving artistic simple and complicated conceptual problems and my approach to them is always multi-layered. I enjoy the combination of different painting techniques. For instance I can use thin and fine brush strokes with impasto technique. My goal is not to copy the reality but to make it look deeper spiritually. Positive attitude to the life develops my palette and color philosophy. The result of my art is represented here. I’m a professional, full time artist, painter, illustrator and art teacher. I received my professional art education in Fine Arts Department of Armenian State Pedagogical University, Yerevan, Armenia. 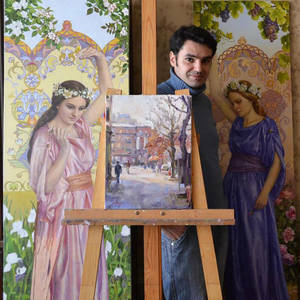 My works are in many collections in France, Italy, USA, Russia, Germany, China and many other countries.